Once a year in late April, roughly 10,000 students in the middle of rural Central, Pa. prepare for the event of the year. It’s an event worthy of the mass hysteria preceding it, the anxious anticipation, the costly preparation, and the restless discussion. It’s an event only fit for a particular group of students who always seem more than ready to celebrate even just the sunniness of a day. A group of students make an otherwise plain and simple Pennsylvanian town a bastion of nightlife for thousands of young adults. The group of students I’m talking about is those who attend Bloomsburg University, and as one of them, let me talk to you about this day of festivity. 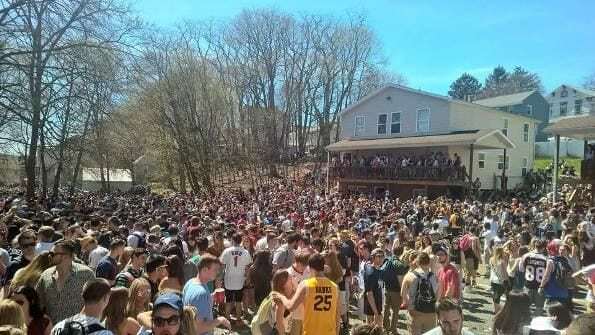 Bloomsburg Block Party: an annual event in which we students of the University get together, primarily on Fetterman Ave. off of Lightstreet Rd., to party and make memories at a place that we will never forget with people we’ll never forget. This event is synonymous with Bloomsburg, as it is in many ways the final deciding factor for incoming high school seniors on which school they are choosing to go to. This may seem like a negative, but it is absolutely not. Some may feel that this represents the party culture of Bloomsburg and shows how students are more committed to partying than schoolwork. In actuality, it shows that compared to other schools of its kind, Bloomsburg is a place filled with enthusiasm, spirit, and close friendships. The very essence of the event displays a unique kind of student unity, as no matter how hard the town law enforcement and University push back against it, we students refuse to give it up. It is our day, not theirs. Sure, any time there is a massive party during the day in a town, there will be some problems. There were 124 open container citations handed out, 73 underage citations, and 37 disorderly conducts. There will be some arrests and there will be some fighting, but that is a given in any situation in which a mass amount of people are at a huge event together. It is extremely hypocritical for the town and the University to discourage Block Party. The town businesses make a fortune on Block Party, totally boosting the economy for a generally impoverished area. In fact, we students completely drive the town economy year round, making it seem comical when town’s people or officials show such distain toward students. Also, Block Party on goings occur in almost entirely student-populated areas of the town and essentially never reach areas inhabited by town’s people anyway. And the next morning, we students promptly clean up the mess before 10 a.m. It is also hypocritical for the University to take such a negative perspective on Block Party. They are well aware that the event leads many students who might otherwise choose elsewhere, deciding to attend Bloomsburg. They also do all they can to disaffiliate from the event while simultaneously scheduling their annual “Springfest” event around the entire day. It all just feels so disingenuous. The town will most likely never get on board with the idea of Block Party and will harshly enforce penalties such as fines, citations, and arrests throughout the day (making a fortune off of us once again). The University will also never get on board, attempting to maintain a squeaky clean image, while constantly benefitting off the event more and more every year. What people on the outside should know about this day is that it is much more than just a day drink. It is a holiday for us students. Believe it or not, the students of Bloomsburg University work incredibly hard all week, all semester, and all yearlong. Though we have our fun throughout, much of the school year is centered on countless hours in the library and prepping for life after school. Block Party is the one day where all of that goes out the window for hours and hours and hours on end. 8 a.m. hits and it feels like mid-day. Lines are forming at Bloomin’ Bagels on Main Street, kegs are moving fast at Campus Beer on Iron Street, and anticipation fills the sidewalks on Lightstreet. The town is flooded with people by 9 a.m. and a constant buzz is about. Music is playing everywhere you walk, and it is hard to go more than one block without seeing someone you know. By 11 a.m. Fetterman Ave begins to fill up. Surrounded by Greek houses, DJ’s, throwback jerseys, and yellow tape, the unique side street becomes a den of animated young college students celebrating the most important day of the year. The atmosphere is unlike any other, and even as police enforcement begins to temper the environment, nothing stops the joyous attitude of the students. Every student who has attended Block Party knows the feeling of waking up like a kid on Christmas morning. It’s that mentality that keeps this event alive. There are many outside forces that attempt to throw cold water on the event, but it really doesn’t matter. To the graduating huskies who just had their last block party as undergrads, I say cheers, it’s been an unforgettable ride. To the town and to the University, who attempt to stop our party, I simply say this; good luck.